Love it or hate it, on 25 May 2018, we’ll all be bound by the new General Data Protection Regulations (GDPR) coming into effect. The EU GDPR replaces the Data Protection Act and takes into account the changes of the digital era. The GDPR has been brought into effect in response to the need to regulate the data protection rights of individuals residing in the European Union. The GDPR is the official update of the 1995 Data Protection Directive, which was created at the very start of the internet era, long before the implications of the digital age were even imagined. Organisations have been given a two-year lead in period to become compliant, ending 25th May 2018. Although we still officially have another year of transition before the GDPR comes into full effect, there remains a need for clarity and guidance on certain aspects of the regulations. However, ignorance is not bliss in this case, and so it is essential that preparty steps be undertaken to be ready for 25 May 2018. Involve your stakeholders from board level and all the way down to your customer service delivery agents, mapping your data at each stage of the customer journey – considering what data you collect, what information do you actually use from the collected data and how exactly do you use it, who has access to the data, and how is it protected during transfer. Establishing the data usage detail, will help you to determine where you leave your company potentially vulnerable to the hefty fines that come into effect: €10m or 2% of global annual turnover, dependent on which is greater; or €20m or 4% of global annual turnover, dependent on which is greater. Fully assessing each of these key areas in relation to your company data, will give you the best all round protection. But hold your horses…it’s not all doom and gloom! 75% of consumers expect organisations to understand their individual needs and want to hear from them. How can we use Social Selling to drive permission based marketing? It all comes down to becoming much more customer-centric, starting with understanding in minute detail what it is that your customers want, what drives them and what their pain points are…and then delivering what they want in an enticing way. At Make Digital Work we are particularly excited about how getting people to opt-in for content that is relevant and interesting in the form of a Lead Magnet, completely transform your customer list into an engaged and target list of leads who are ready to convert into paying customers. Adopting a marketing system that incorporates an authentic social selling element, that is GDPR Compliant, means starting with getting to know your customer really well first and then delivering key pieces of information strategically, so your customers are willing to freely give their consent. It not only naturally ensures you remain compliant, but more exciting is you are building a list of engaged prospects who WANT to hear from you. By periodically offering these opt-in opportunities through email and social channels, you are incorporating periodic re-permissioning into your marketing programme. Minimising the risk of losing 50% of your lists through a traditional ‘Do you still want to hear from us’ approach. It’s important that we are able to LISTEN, to INFLUENCE and CONNECT with our clients in equal parts to ensure that selling becomes a natural progression of the relationship. Following a nurturing programme ensures that the consent is refreshed every 60-90 days and provides compliant segmentation for your list at the same time. Changes to regulation of data may well have a far-reaching impact on how your business does business, and how it manages its data, but adopting a Customer-led information delivery system will not only help you stay compliant, but will deliver an engaged customer base who want to do business with you. 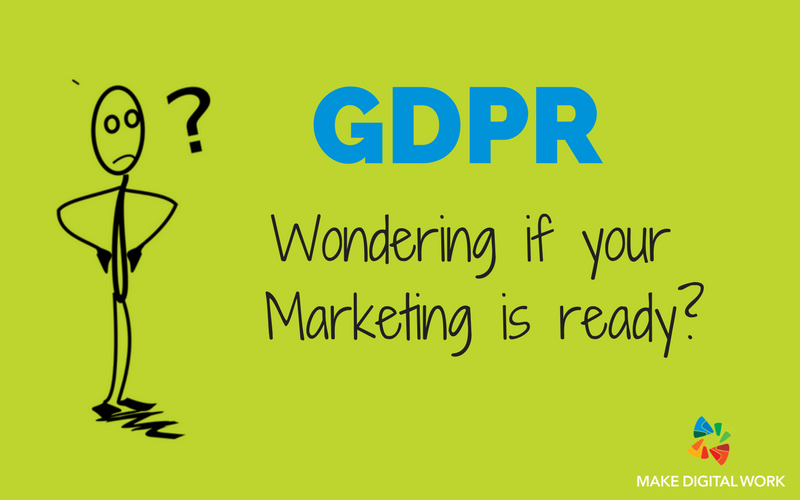 Talk to us to book your GDPR MARKETING ASSESSMENT today! A comprehensive gaps analysis to give you a snapshot of your business marketing practises, how effectively you are ‘Putting your Customer First’, as well as identifying areas you need to focus on to deliver customer-centric marketing . Helping you to determine what you’re doing right, what you need to change and how to deliver compliant, yet effective marketing campaigns. to ensure the required automation and tracking is in place and working for effective marketing, lead generation and communication. of the key metrics at each stage of the funnel, ensuring each stage of the customer acquisition journey is covered and the funnel is optimised within the framework. Strategic content audit looking if each stage of a customer journey has content and that each piece of content is optimised to increase leads in numbers and in quality. Look at on page SEO and analytics to suggest immediate and longer term plans of action needed to ensure that data can be collected to improve the acquisition of customers without falling foul of the GDPR regulations. How to create UNLIMITED leads for a LOCAL, BRICK & MORTAR Business.